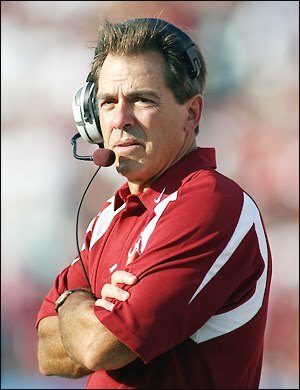 It’s true: I’m pretty much obsessed with Nick Saban. On January 3, 2007, lying prostrate before the television, I came to tears when ESPN announced that Saban would accept the position as head coach of my beloved Alabama Crimson Tide. Thirty-three wins, two SEC West Titles, one SEC Title, and a BCS National Title later, my epic man-crush has done nothing but grow. I beam when I hear the man’s name. Anyone with an objective, discerning mind reasonably may ask why I, a youth minister, adore a man that CNN rated the ninth most hated man in sports in 2009. Let’s be honest, outside of his success in football, Nick Saban is best known for his tendencies to humiliate journalists, never smile, and berate players and officials. 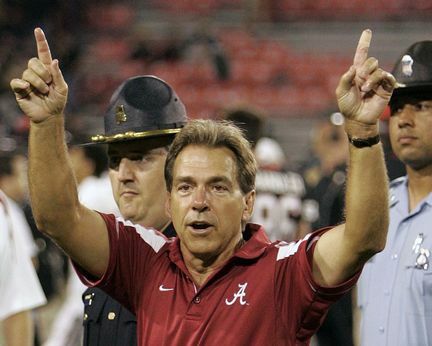 Many people- especially journalists- would describe Saban as a jerk. With that being said, I literally would beam with joy if Coach Saban called me tomorrow to come to his house to shovel dog mess and scrub his bathrooms with a toothbrush. My obsession knows no end. Even though, I am a slow, middle-class, unathletic, weak, average youth minister, I am a freakin’ national champion in my warped reality, when I don my worn, mesh Alabama hat. I have contributed absolutely nothing to attain this status. Nick Saban, his staff, and some unbelievably athletic and committed young men worked endless hours and performed in an exceptional manner to win fourteen straight games, including the BCS National Championship Game in Pasadena. Through the efforts of these men, I have been given the status as national champion (in my mind), in spite of the fact that I added nothing to their cause. This, my friends, is the nature of the doctrine of imputation, one of the most critical concepts in Christianity: the accomplishment of one person is credited to another. Christ lived a perfect life and died on the cross, not just to forgive our sins, but to give us new identities. In spite of the fact that we make no contribution whatsoever. I have one more month to enjoy my inherited status as the national champion until college football kicks off in early September. Thanks be to God, my status as a son of God will last through the Fall and into eternity. Read more on and from Camcole. Great post! Love it. Not an Alabama fan… from ACC country… but a very strong analogy. Good stuff! And simul justus et peccator, that status is credited to you even though you continue to support lesser Gods, I mean, programs, i.e. Wake Forest. I'm loving all the sports posts on here recently… and this is the best of all. Nice work Cameron. Great post Master Cole. You also describe a concept from social psychology named BIRGing (basking in reflected glory … ing). I've never considered the link between BIRGing and imputation, but in my limited understanding they are about the same. Any comment from someone more knowledgeable regarding subtle differences? Nice work. Well written and interesting topic. I look forward to hearing the sermon version of this one day. Basking and Imputation are similar, but not quite the same. An Alabama fan can be TREATED as a national champion, but when it comes time for rings to be handed out, they're not getting one. Christian imputation refers to the counterintuitive and creative work of God. When he regards something as righteous when it is not, his word to it: "You are righteous," actually CREATES the righteousness that was not there before. Our righteousness is not just a reflection of God's, but is in fact his, given to us. It's a greek word: logizomai. I'm not sure what the accepted transliteration is…not that it matters. Fitz calls it (imagine awesome accent here) "the Word made verb."